There is something in the Society’s collection for every interest. A leather bound alphabetical index book lists all dogs registered in Port Melbourne in 1892 by owner surname. Even in 1892 there were dogs large and small – from Newfoundlands to poodles. 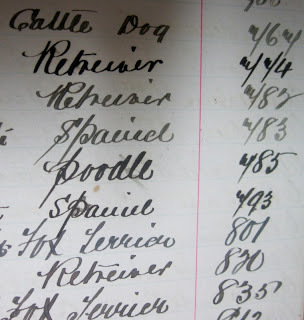 The names of the dogs are not recorded – that would have been revealing. 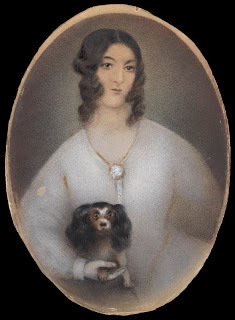 This undated portrait of Mrs Caroline Liardet as a young woman, before she came to these shores, shows her with a rather surprised looking dog on her lap – is it a King Charles spaniel? You can see her image as an older woman in our banner picture. Caroline Liardet was the wife of Wilbraham Frederick Evelyn Liardet and mother of their nine children. 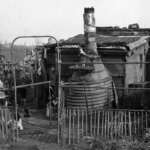 They arrived in Sandridge on board the William Metcalfe in November 1839. 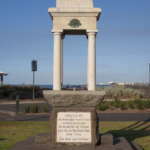 Port Melbourne plays Williamstown at North Port Oval this weekend. The role dogs play in this old rivalry is amusingly told here. 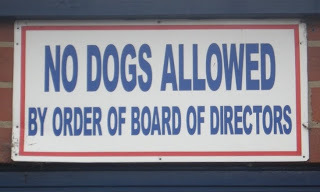 As you can see, no dogs are allowed but that rule was apparently flouted by a President of the Williamstown Football Club. Any dog tales out there?